First Lady, Melania Trump beautifully wore this suit on Inauguration Day. As history does repeat itself, rumor has it that Former First Lady, Jackie Kennedy, wore a very similar version. They say that imitation is the sincerest form of flattery! 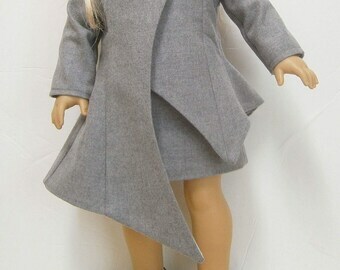 Now, it’s your turn to outfit your 18 inch doll in this very sophisticated and timeless outfit, too. Pattern is available now, for download. Email will include printable pattern pieces, and step-by-step instructions. Instructions will also include images for better guidance. The pattern set includes pattern pieces for a look-alike dress suit that Melania Trump wore to the Inaugural Ball, sized for your 18 inch doll. If you sell items made from this pattern design it would be appreciated if you would credit MPPBoutiquePatterns for the design. J 'aime bien ce modèle et facile a comprendre!Merci! !